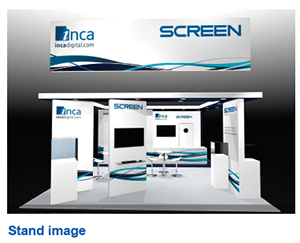 SCREEN GA and Inca Digital to demonstrate the power of partnership at InPrint 2017 | SCREEN Graphic Solutions Co., Ltd.
SCREEN Graphic Solutions Co., Ltd. (SCREEN GA) and Inca Digital Printers Ltd., part of the SCREEN group of companies, have officially announced today that they will be co-exhibiting at InPrint 2017 at the Munich Trade Fair Centre, 14th - 16th November 2017 (hall A6, stand 364). Both companies will feature an extensive range of products and solutions on the stand that aims to show the strength of their leadership in the field of industrial inkjet printing. In June 2016, SCREEN GA announced an exclusive partnership with BHS Corrugated Maschinen- und Anlagenbau GmbH to develop a 2.8 meter width single-pass inline digital print solution for BHS Corrugated. At InPrint 2017, SCREEN GA and Inca will showcase the print engine, incorporating Fujifilm Dimatix's Samba print heads, as well as print samples and an on-stand video showing the 1.6 meter width single-pass technology demonstrator in action. Inca Digital will use its stand to profile its growing range of bespoke robotic material handling systems, which are increasingly being installed at businesses looking for automation and productivity improvements. Demonstration videos will run with specialists on the stand to answer questions and provide industry leading case studies. IncaConnect - the company's powerful new software suite, which offers the ability to seamlessly integrate Inca printers into existing MIS and prepress software systems, will also feature prominently on the stand. Visitors to the show will also be able to see Inca Digital's Onset M B1 digital inkjet technology, introduced to the industry earlier this year, in action in a Fujifilm-branded version of the machine on stand 428 in hall A6. SCREEN GA will showcase its 350 mm width single-pass print engine that is currently incorporated within its Truepress Jet L350UV, SCREEN GA's web-fed UV inkjet label press. The technology combines the high-productivity and stability of SCREEN's inkjet technology and the image processing technology cultivated in the CtP and prepress workflow market. Blister packaging samples -one of the new applications currently being developed using this technology - will also feature on the stand. Finally, Stephen Tunnicliffe Wilson, Inca Digital's Director of Research and Development has been confirmed in the line-up for the conference and will be presenting on the topic of 'High Precision Printing for Metal and Cartons'. We are very pleased to be exhibiting with Inca Digital at this year's InPrint 2017. SCREEN GA's single-pass and continuous-fed paper control and Inca Digital's multi-pass, flatbed systems are all proven in their fields and the print engines that drive these have so much to offer the industrial print sectors. We invite visitors to the show to come on the stand and explore just how diverse our industrial printing applications are, and the new opportunities and potential revenue streams they can provide businesses. InPrint 2017 gives us a great opportunity to demonstrate the depth of our innovative thinking when it comes to industrial printing technologies and applications. We are looking forward to some very interesting discussions with, and opinions from, visitors and our peers on how inkjet technology is dramatically transforming the industrial printing market.